Foster admits the signoff, but blames civil servants. Mistakes in amending the complex documentation led to the scandal. She was not kept up to date with further developments. This is untrue. The legislation is a simple cut and paste of the British documents, with the section on cost controls removed – a political decision that no civil servant would have made. More and more local businesses are coming forward to say that they wrote to the department and warned of the dangers of abuse. Finally claims that Foster was at arm’s length from the process were disproved with the emergence of a letter from her to local banks asking them to support loans for firms joining the scheme. The DUP set up a money trough for their supporters. The more you burnt, the more you made. The British Treasury would pay. The treasury closed the tap, but contracts are set to run for 20 years and the money will come from one of the most deprived areas in the British Isles just as the DUP/Sinn Fein austerity programme hits the unemployed, the disabled and the public sector. It’s hardly a surprise that there have been calls for Foster’s resignation and fresh elections, but these are based on the illusion that the Good Friday structures are a form of parliamentary democracy. However, unlike a democracy, no motion of censure can force Foster’s resignation nor is an election likely to change the make-up of the administration. Following the Stormont meeting before Xmas, the press reported that Arlene had “survived” the vote. In fact she lost the vote, but not enough unionists voted her down to meet criteria of cross-community support. Even if Sinn Fein had voted against instead of abstaining the DUP would have deployed another cross-community device called a “petition of concern” to negate the vote.The sectarian structures within Stormont mean that votes of confidence count for nothing. Only the DUP can depose their leader. The same thing applies to a general election. Votes don’t count. 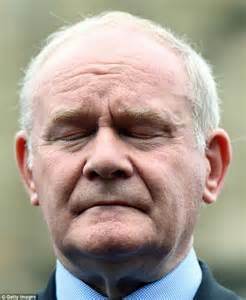 An election can only be called if Sinn Fein resign their seat as deputy first minister, if the DUP agree one, or if the British secretary of state dissolves the assembly. Sectarian logic applies to the election process itself. Continued unionist support for the institutions is dependent on unionism holding the first ministership as the largest party. In all elections sectarian fears are brought to the fore and unionist parties strike deals to ensure a winning candidate in each constituency where this is possible. The outcome, barring the collapse of the Good Friday structures, is the return of the DUP. Structural sectarianism extends into the internal life of the parties. The DUP can force Arlene Foster to step down, but to do so would upset a delicate balance between the factional alliances that make up the party and might awaken a right wing who feel that coalition with Sinn Fein is too high a price to pay for a devolved administration. The RHI scandal calls into question yet again the stability and long-term sustainability of the Irish peace process. One might object that this kind of structure couldn’t work. The answer is that it doesn’t. The main business of the assembly is to share-out resources on the basis of sectarian privilege. Its output is a routine of scandals based on sectarian corruption – RHI is simply the largest and latest. In terms of democratic norms the most recent scandal – an alliance between the leading government party and a banned paramilitary group currently involved in drug-running and intimidation – was much worse. Sinn Fein and the trade unions were silent even though millions were spent to give the loyalists undisputed control of local communities. But to really get to the heart of Arlene’s impunity we must take into account the role of Sinn Fein. They are junior partners in the coalition: They have smaller vote, the British back the unionists. Dublin, the Catholic Church and the Catholic middle class are violently opposed to any challenge to the system. In this environment they must desperately wave their presence in government and the share of sectarian patronage they control as proof of the success of their strategy of working within the colonial system. And this is not enough. They have closed their eyes to scandal after scandal involving the DUP and agreed endless shifts to the right as a necessary element of keeping Stormont going. It is only necessary to add the frantic support of the trade union leadership for the Stormont institutions – support so great that they agreed to accept the “Fresh Start” austerity programme in order to avoid instability – to see how endless shields and locks protect the institutions. For the DUP there is likely to be a fall in their vote, adding greater instability as they search for the magic number of seats to confirm their hold on the first ministership. There will be divisions inside the party. One minister, Jonathan Bell, broke ranks and has been savagely attacked and this will mean tensions with the Paisleyite and evangelical wing of the party. A resignation or election also collapses the latest DUP strategy of dealing with a forced coalition that they utterly detest. Under Paisley they claimed that the coalition was the only alternative to Dublin rule. Under Peter Robinson they promised pragmatism – businesslike deals that would share out patronage. The result was revolt. Foster’s approach, based on DUP victories in the Stormont house and Fresh Start talks, was to pretend that unionism had returned to glory days of the 1950’s, rejecting any criticism and letting the nationalists have the rough end of her tongue. Her fall would bring forces on the right of the DUP into play and would mark a step towards the final collapse of the ramshackle assembly. However in any coalition it is the junior partner who suffers most, and this is the case with Sinn Fein, caught in a scissors. They have to remain silent in the face of an unending stream of DUP scams and insults in order to preserve the administration. The result has been the gradual erosion of their voting base as promises of equality and progress come to nothing. The current crisis illustrates their dilemma. Sinn Fein warned the DUP that “serious consequences” would follow if Arlene did not step aside. When a confidence resolution was put forward they abstained. Asked afterwards about the consequences Martin McGuinness said that they were simply offering advice. The resulting uproar among their membership has led to a new “serious consequences” statement in the New Year. Now Sinn Fein say they will put a resolution calling for Foster to stand aside and trigger an election if she refuses. However their position is much less radical than it appears. Both they and the DUP are calling for an investigation, where the other parties want a judicial enquiry. Both parties focus on the recovery of money, even though everyone agrees this should be attempted. They call for Foster to stand aside, following a procedure followed by Peter Robinson in an earlier scandal. The implication is that she could return as First Minister. This mechanism, unique to Stormont, is a clear rejection of any genuine democratic accountability. The sticking point is that the DUP, united behind Arlene on a platform of sectarian triumphalism, will not agree a step aside. As evidence of their dismissal of nationalism, the DUP cancelled a small bursary, the Liofa scheme, one of the tiny remnants of the promise of recognition for the Irish language that was supposed to be a central element of the peace process. The pressure on Sinn Fein is immense. Do they agree fudge with the DUP or call an election which will see their vote decline and see Arlene and the DUP return? The British have already indicated that they are unlikely to step in to save Sinn Fein. Stormont can sink or swim. Whatever happens the political collapse of republicanism means that there is no sizable resistance to British rule. Whatever happens, Sinn Fein are correct in saying that the system is at a tipping point in terms of credibility. They don’t say that their own credibility and long term survival are tied to a bankrupt strategy. The Irish peace process has rotted away from the inside. It still needs a good push from the outside. The trade unions, pledged to accept austerity to save Stormont, have nothing to say. Their allies in the reformist left live in a la-la land where public pressure can force resignations, elections can change the Stormont system and enough socialist MLAs could convert the carnival of reaction into a temple of socialism. To a certain extent this reflects the understanding of the working class. Many oppose open sectarianism, but feel that there is some benign form that could share resources peacefully. They despise politicians, but feel that a team of better politicians could manage better. Politics are avoided as many have been convinced that the only alternative is armed conflict. That silent acceptance and despair will not survive indefinitely as jobs and benefits are scrapped while the DUP’s pals continue to earn as they burn £500 million in public money. What is noteworthy about the RHI scandal is that it is not the scandal itself that has brought about crisis but the refusal of the DUP to use a “get out of jail free” stepaside card that was used by former leader Robinson. Yet it is barely seven months since an election confirmed the victory of the DUP in winning the acceptance of sectarian supremacy at the Fresh Start talks. Calls by nationalists for the British to rein in loyalism gave them almost total impunity. The belief was that this would usher in a new mature political settlement where everyone knew their place. Yet in a sectarian society where one party has supremacy it is not enough to assert triumph once. It has to be reasserted on a daily basis so that the vanquished bent the knee. This is the basis of the Foster regime. This is what has brought the system to its knees. This is why the pacification process will never lead to democracy. The call “Smash Stormont” and the struggle for a 32 county workers’ republic is the only legitimate response that socialists can make. Without this call we have not taken the first step to proposing an alternative society based on the Irish working class.